Bitcoin casino affiliates earn huge profits through the offers of different affiliate programs and, of course, through their own marketing skills. What could make their journey to success faster is when they partner with at least one of the leading casinos in the gambling industry—among them, NetBet. This gambling site is known for its casino, sports betting events, and poker. Having this wide coverage of wagering activities, you have a bigger chance of attracting all types of players. 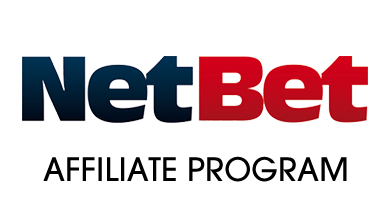 To know more about the benefits of being a NetBet partner, read this NetBet affiliate program review. Live Partners powers the affiliate program of NetBet. Since the gambling portal offers not only casino but sports betting as well, there are two commission packages you can make the most of: CPA for sports/poker and CPA for the casino. Both these deals require you to refer as many players as you can. The CPA scheme has wagering requirements and baseline deposit. For sportsbook and poker, you must have at least 21 players to receive €50 per referred bettor. For the casino, on the other hand, inviting 21 or more new depositing players could mean €100 CPA for you. In this affiliate program, you can earn not only via the CPA deal but also through rev sharing. While getting upfront payments per player you bring in, you also get lifetime monthly earnings based on the net gaming revenue your referrals contribute to the casino. Twenty percent rev share is yours when you rake in at least 10 first-time depositors. The percentage gets higher as more new NetBet players sign up through your affiliate links. You can get the maximum rate of 40% for only 100 or more new depositing players per month. NetBet Casino is one of the oldest online casinos in the industry. The online casino has been able to keep its business since it started operations because of its entertaining games—slots, blackjack, roulette, live games, and baccarat. Betting on the most popular sporting events, like football and tennis, is also available here. More so, weekday bonuses and other special offers are part of the highlights of this gaming site. You can use these promotions and even the rich gaming library to market the betting site to global players. With NetBet’s popularity and reputation, you will find that marketing the brand is easier than promoting other betting sites. To strengthen your campaign strategy even more, the affiliate program will provide you with banners, landing pages, text links, and sportsbook widgets. Be sure to use these marketing tools wisely for more income. Bitcoin affiliate programs allow you to keep track of your progress through tracking reports. With NetBet, you can expect that every month, you will receive a report about your marketing performance. Along with it is a summary of all your receivable earnings which you will get within the first two weeks of the following month. As a NetBet affiliate, you are given a wide choice of payment methods. You may withdraw your payouts via Neteller, Skrill, and WebMoney, among others. Keep in mind that if you have a negative balance, you will be taking it with you to the following month. Do not worry, though, because Live Partners will help you develop strategies geared toward raking in more players for you to avoid incurring a negative balance. For more inquiries, except that the email support channel is always there for you. All your questions regarding payment, marketing tools, and account information will be handled accordingly.